Until WebSDR came along, listeners could not tune a ham radio online receiver to many different frequencies simultaneously! A WebSDR receiver/server combination requires a broadband Internet connection to allow many individuals to listen to signals simultaneously. Each listener takes up several hundred kbit/s of bandwidth! Lots of bandwidth is one of the reasons why you will usually find a WebSDR operated from a location within a university building! My favorite, even if limited to only three bands on HF (20,40,80 meters), is the WebSDR receiver-server operated by the amateur radio club - PI4THT - of the University of Twente, Enschede, NL. This receiver has been online for quite a few years and is very dependable. The user interface is simple to operate and provides enough control possibilities, of the frequency and passband adjustments, to satisfy casual listening and sampling of the quality of reception that is possible with a SDR ... even a "bare-bones" one! Once you get the hang of the waterfall display, you can easily spot a SSB signal (for instance) and slide over to listen in. Compared to the old way of "tuning around" blindly with a VFO dial, the waterfall display is a very enjoyable feature of a typical SDR user interface. 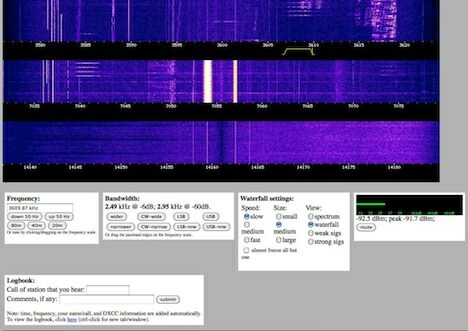 When you own a full-fledged SDR, and with a little practice, you will be able to recognize different modes of communication used in ham radio (SSB, SSTV, RTTY, FAX, etc) on sight on the waterfall and "slide" over to tune them in. Very neat stuff! Another one I like very much is the WebSDR receiver/server located at Walla Walla University's amateur radio club station K7UEB, on College Place, Washington, on the West Coast of the USA. K7UBE's online receiver only gives access to the 20 meter band (14.102 - 14.198 MHz). On the other hand, I found that this server is located in a less noisy location than others. Part of the explanation might be the antenna, a Mosley Classic 36 at 90 feet!